Loves breaking web applications and ceramic bowls. 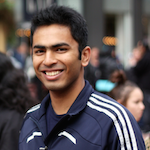 Tushar Dalvi is a security enthusiast, and currently works as a Senior Information Security Engineer at LinkedIn. He specializes in the area of application security, with a strong focus on vulnerability research and assessment of mobile applications. Previously, Tushar has worked as a security consultant at Foundstone Professional Services (McAfee) and as a Senior developer at ACI Worldwide.